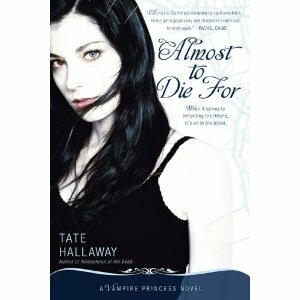 I am not quite sure how to describe this book other than the fact that it was fun…I love change of pace YA books that have quirky mouthy main characters…and this book certainly had that in the form of Ana…who might or might be a really bad witch or a really good vampire or actually half of each. That was the funny part. Her father married her mother in order to stop a vamp/witch war and Ana’s mother has never told her one thing about her vampire dad until he sort of just appears in her yard on her sixteenth birthday. The book was really good and really funny. Ana considers herself a geeky nerd who is a failure at being a witch. She has no clue about her vampire part until she accidentally licks the blood off of the face of a classmate in a freak gym accident. And there is a weird naked vampire who says he is betrothed to Ana while at the same time she is sort of involved with Nicholai who is a witch and a vampire hunter and in a great band. You have to get the drift of this book…just action packed and mysterious and really really funny at the same time…Ana sort of reminded me of Rachel from Hex Hall. Cheeky interesting geeky main characters who are fun and brave and get into major scrapes. You might want to look for her Garnet Lacey series too. It is adult but has the same quirkiness as this one. Happy reading! Kathy, thank you…I am looking them up now…I loved this one!!! I haven't gotten into vampires yet, but this one doesn't sound too angsty, so I might enjoy it. I love mouthy characters from time to time.